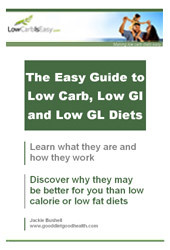 At first, planning your meals for your new low carb, low GI or low GL diet seems easy. You've got a list of foods to avoid and foods to eat. If you're working from a 'diet book' you may even have a set of diet menu plans for the first week or two. But what happens when you've run these a couple of times? You're bored and that's danger time for your diet. What you need now is some more menu plans, bringing fresh ideas to your low carb diet, so that you don't fall into the "I'm bored with this diet" trap. Our Atkins, low carb, low GI and GL menu plans are great for helping you decide what to eat when you've run out of ideas. They're all original, so they won't be duplicates of menu plans you've seen before. a 14-day menu plan for Atkins induction and other low carb diets, which is also suitable for low GI and low GL diets. 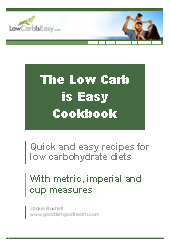 Our low carb, low GI and low GL menu plans come as a free bonus with the 'Easy Guide to Low Carb, Low GI and Low GL Diets' and 'The Low Carb is Easy Cookbook'. To see what over 1600 people think about our menu plans, check out our menu plan poll.